The Holy Father, Pope Francis, has appointed Cardinal Vincent to membership of four dicasteries of the Roman Curia. On 22 May, Cardinal Vincent was appointed to the Congregation for Clergy, the Congregation for Bishops, the Congregation for Oriental Churches and the Pontifical Council for Promoting Christian Unity. This means he is now a member of four bodies of the Roman Curia, the other two being the Congregation for Bishops – which oversees the appointments of bishops across most of the world – and the Congregation for Oriental Churches, tasked with relations with Eastern Catholics. 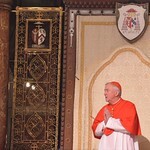 The Pope also appointed the other cardinals he created in February to a host of Vatican dicasteries or offices. As is custom, the new cardinals are appointed to offices of the Holy See after they receive their red hat.